Chempak® Multi Purpose Base 800g Carton - Aids the conversion of peat into multi-purpose compost for use all around the garden. 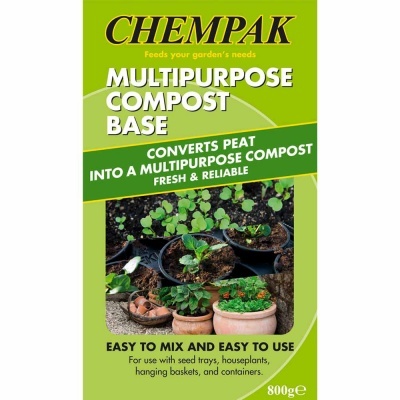 Chempak Multipurpose Compost Base is precisely balanced to allow germination of seeds, yet strong enough for vigorously growing plants. An inexpensive way to make multipurpose compost that is ideal for all growing environments, providing superb results. 800g makes 100 litres of multi-purpose compost, suitable for many uses such as in seed trays, for houseplants, troughs, planters, hanging baskets etc. Not suitable for 'lime hating' plants.